Immerse yourself in the bygone cultures and impossibly beautiful wilderness of Guatemala and venture across the border to Honduras. Immerse yourself in the bygone cultures and impossibly beautiful wilderness of Guatemala and venture across the border to Honduras. Home to Mayan ruins, towering volcanoes, vibrant indigenous cultures, Guatemala will surprise you. Stroll Antigua’s narrow cobblestone streets and discover a rich colonial town. Float across the natural wonder of Lake Atitlán. Search for handicrafts and fresh produce in the delightful market town of Chichicastenango. Seek out the towering jungle-cloaked temples of Tikal. Move to a whole new beat in otherworldly Livingston. Be amazed at the ancient Mayan ruins of Copan in Honduras and savour the subtleties of the country’s coffee craft in the lush hills. Receive a warm A&K welcome and proceed to your luxury boutique hotel in the beautifully preserved Spanish colonial city of Antigua, located one hours’ drive from the airport. One of the most enchanting colonial towns in Latin America, Antigua, in the shadow of a towering volcano, is fascinating and deservedly a UNESCO World Heritage site. After freshening up, ease into local time on your private walking tour. Wander through the 500-year-old streets and elegant plazas punctuated by flowering trees, red-tiled roofs and church bell-towers of what was once Central America’s most powerful city. Take a short drive to San Miguel Escobar, a quaint town situated at the base of Volcán Agua. Meet families supported by De La Gente (DLG), a non-profit organisation supporting small independent coffee producers. Work side-by-side with farmers as they husk the fruit, ferment, wash and dry the beans, sort and roast the beans, and – finally – taste. Later, join a local family for a traditional lunch. Adventure awaits those who trek Guatemala’s active Pacaya Volcano. Bask in the unfolding panorama as you climb from the foothills through a lush pine forest. Step over the barren moonscape to marvel at the fiery glow of lava and steam rising from vents that dot the forever-changing landscape. Savour views of the summit as you feast on a well-deserved sumptuous picnic lunch, before an easy walk down. Day 4: Antigua – Lake Atitlán. Journey through rolling farmland and villages to the highland town of Chichicastenango. Nestled in the El Quiché valley, “Chichi” may seem like a tranquil, sleepy village outside of market days, but twice a week it comes alive as Mayan people from the whole country gather for the largest market in Central America. Follow the chaos of vibrant, almost endless stalls running from the central square, up through the stairs of the Santo Tomás Church, and beyond. From the rich textures of native textiles to smells of traditional incense, this market promises a feast for the senses. Later, visit the surprisingly colourful cemetery, where a local shaman will perform a Maya ceremony for you. Sample local delicacies over lunch before continuing onwards to Lake Atitlán, Guatemala’s geological show-stopper and your intimate hotel overlooking the lake. Cruise across the crystal-clear lake to the shore-side village of San Juan La Laguna. Meander through this petite Tz’utujil Maya town to admire impressive murals, galleries and artisan shops. Step inside a local artist’s studio to spark your creativity with naïf paintings. of Guatemala’s richly colourful textiles. Following a traditional lunch at one of the cooperatives, try your hand at weaving richly coloured textiles in a workshop led by a women’s cooperative. Day 6: Lake Atitlán – Guatemala City. Lose yourself in the magic of Lake Atitlán during your morning at leisure before the journey continues to Guatemala City. With a free evening to explore, venture into the city’s bohemian hub of Cuatro Grados Norte for surprising street art, artisan cooperatives and chef-owned restaurants. Day 7: Guatemala City – Copán, Honduras. Journey to the Honduras border and on to the town of Copán Ruinas, home to Copan, the most southerly point of the ancient Maya Empire and one of their most lavish cultural centres, now a UNESCO World Heritage site. Continue to your lovingly restored hacienda, perched on the hillside overlooking the picturesque Copán Valley and temple tops of the ancient site itself. Discover the towns cobblestone streets, picturesque plaza and nearby restaurants. and gain a valuable insight into the military strategies of the ancient Maya. Travel into the Copán Valley and spend the day in the warm hospitality of the Castejón family at Finca El Cisne. Together with your host, Carlos, take an easy horse ride through the forests and fields, and learn the secrets of coffee, cardamom and cacao farming. Gather around the family table for a hearty farmhouse lunch, prepared by Carlos’ mother from home-grown produce. Before you return to Copán, take a soothing dip in steaming thermal pools hidden in the forest. 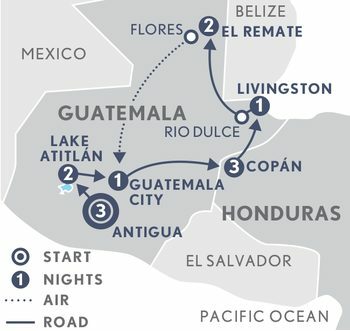 Day 10: Copán – Livingston, Guatemala. the hypnotic beat of bongo drums, conch shell horns, turtle shell drums and maracas that echo from street corners. And taste a whole other side to Guatemala, starting with the remarkable coconut seafood soup, tapado. Day 11: Livingston – El Remate. Journey to Rio Dulce and cruise along mesmerising blue-green waterways past coastlines lined with pines, Casa Maria trees and mangroves. Stop at the Maya village of Ak-Tenamit and meet the locals. Then, drift silently towards an aptly named Bird Island and scan the shoreline for jaguars or manatees, before docking at your rainforest lodge, a creation of Francis Ford Coppola, for the night. Be transported to an ancient world in Uaxactun, one of the oldest complete Maya astronomical complexes yet discovered. Roam the many treasures of this site, before a traditional lunch prepared by locals. Venture further into the jungles of El Peten where the awe-inspiring pyramids of Tikal’s ruined temple complex rise through the rainforest. Walk in the footsteps of royalty in the majestic Great Plaza and Temple of the Jaguar, as howler and spider monkeys look on from the dense jungle. Your sunset picnic at Temple IV is one of those never-to-be-forgotten moments. Day 13: El Remate – Flores - Guatemala City. Private early morning transfer to Flores for your connecting flight to Guatemala City and your onward arrangements.